Interesting covers presented by BNAPS members. 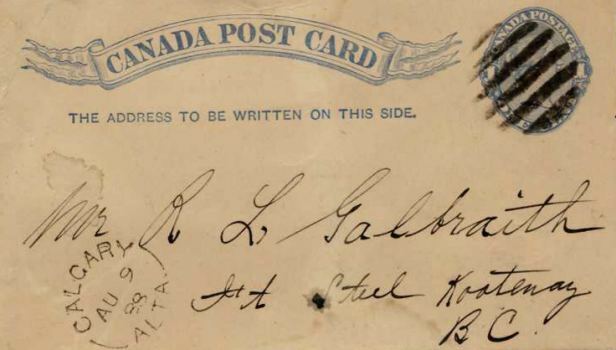 The covers on this page show various facets of Calgary postal history. They are presented by the BNAPS Calgary Regional Group. In the list below, the covers appear in the order posted, most recent cover first, but on the page itself, they appear, with one or two exceptions, in chronological order, earliest first. If you have any questions or comments on the Calgary covers, or have one of your own that you would like to display, send an email to the ORE Committee. 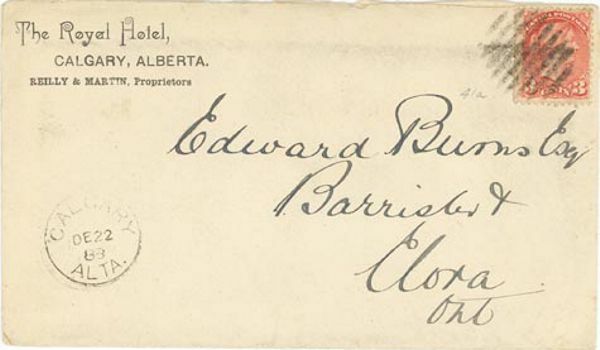 Cover addressed to Major James Walker, Bow River, N.W. Territories by Fort Benton, Montana, U.S.A., from CARLUKE / ONT / OC 10 / 82. 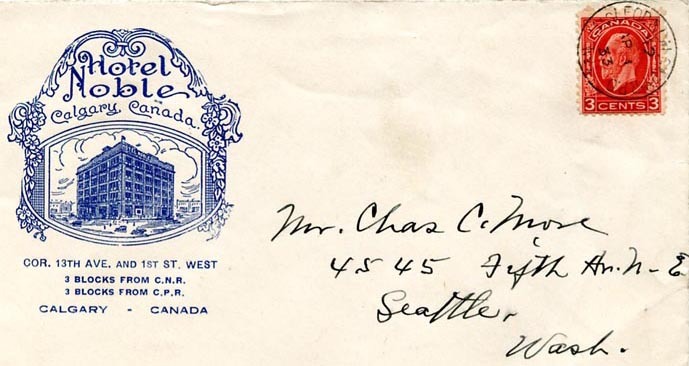 No receiving mark, as no Calgary post office existed at that time. The North West Mounted Police (NWMP) established their first permanent post in the west at Fort Macleod in 1874. In the following year, a post was established on the Bow River at what is now Calgary. No Canadian mail route existed into the territory up to the early 1880s, and mail was forwarded up the Missouri River to Fort Benton, Montana, and thence by bullock team north to Fort Macleod. This route continued to operate until the Canadian Pacific Railway pushed across the prairies. Major James Walker was a well known member of the NWMP. 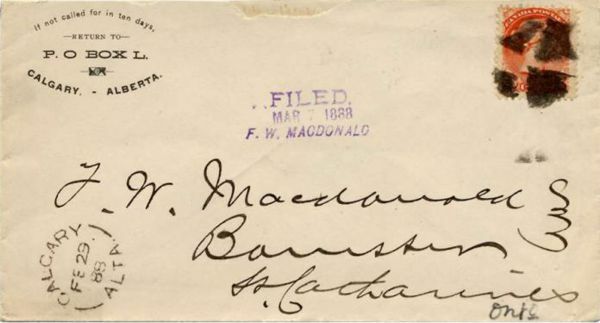 Born in 1846 near Carluke, ON, where this letter was posted, he joined the NWMP in 1873, and served with distinction until 1881 when he left to become the manager of the Cochrane Ranche Company, one of the largest ranches in the territory. 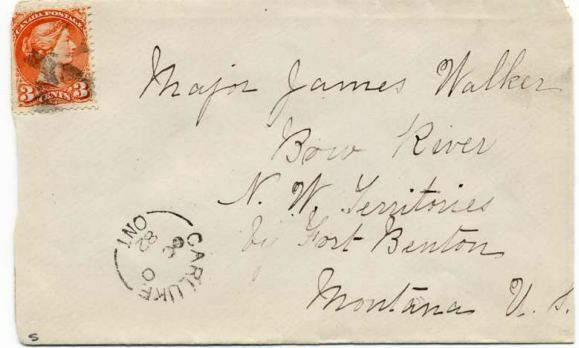 A postcard mailed from Montreal on April 14, 1882, to the Cochrane Ranche Company and its route through the U.S. are discussed in . Walker left the ranch in 1882 and took over a sawmill that supplied much of the lumber for Calgary and area. Victor Willson, "Postcard to Western Canada through the US", BNA Topics, Vol. 64, No. 3, July-Sept. 2007. The duplex cancel on the front reads WINNIPEG / CANADA / 1 / FE 19 / 85. The Calgary, NWT, receiver on back is dated FE 26 / 85. As noted under "1882: Major James Walker, NWMP", Walker took over a sawmill in 1882. He also established a farm east of Calgary, which is now part of the Inglewood Bird Sanctuary. He formed the Home Guard during the 1885 North West Rebellion. 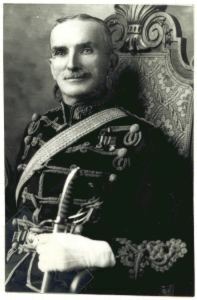 He was a Lt. Col. of the 15th Light Horse from 1905 to 1911, and served overseas in World War I as the commanding officer of the Canadian Forestry Corps. Walker was a prominent Calgarian. In 1884, he was declared chairman of the newly formed Calgary Citizen's Committee, he helped establish Calgary's first school district, he was a school board chairman, he was the first Boy Scout leader, and he was director of the first general hospital and active in both the Southern Alberta Pioneers and Old Timers Association and the NWMP Veterans Association. He is credited with laying Calgary's first sidewalk, stringing the first telephone line, providing the city with its first commercial and residential natural gas illumination, and founding the Calgary Agricultural Society (forerunner of the Calgary Stampede). James Walker died on March 31, 1936, shortly before his 90th birthday. In 1975, he was named "Calgary's Citizen of the Century". 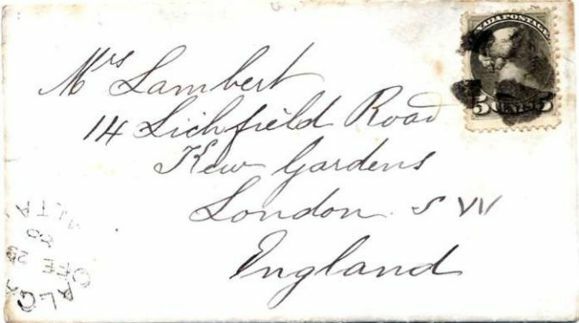 The James Walker correspondence was dispersed years ago, but the alert collector can still find interesting and historic covers and postcards from this correspondence. In 1875, the North West Mounted Police (NWMP) built Fort Calgary on the west bank of the Elbow River at its confluence with the Bow. A tent town had grown up on the east bank across from the Fort and had dramatically increased in size in anticipation of the coming of the CPR in 1883. The first CPR train, loaded with dignitaries, was greeted with great excitement and fanfare when it arrived on August 11. 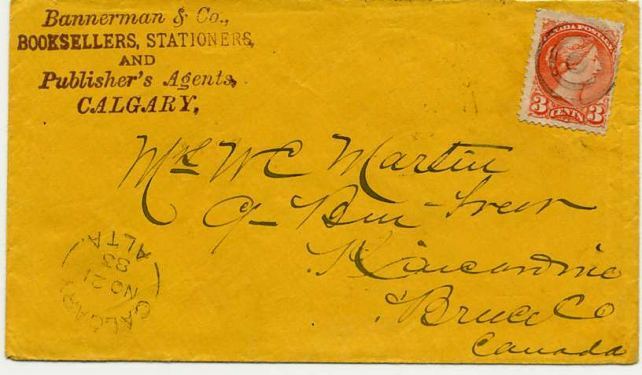 Calgary's first post office opened in the tent town on October 1, 1883, with William Bannerman as its first postmaster. 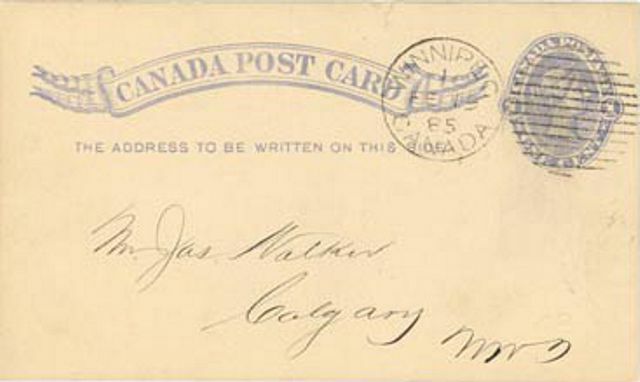 The cover shown was mailed on November 21, 1883, and is an early strike of the first Calgary hammer. 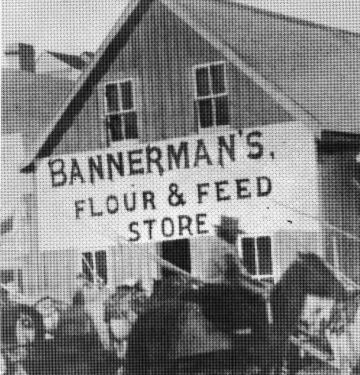 The Bannerman corner card refers to William's brothers, Joseph and James, owners of the feed store which was located across the street from the newly built CPR station. In the early months of 1884, the Calgary post office building was moved to the newly forming downtown Calgary and was close to the CPR Station. Sometime later, the post office moved into the back of the Flour and Feed store. A Six Cents Small Queen pays the double weight postage. On the back is a TORONTO / ON / AM / AU 27 / 84 receiver, so the letter was six days in transit. The postage and registration are paid with a Six Cents Small Queen and Two Cents registration stamp. The envelope is sealed with a large red wax seal showing "Department of the Interior" which may have added that little extra weight causing the double postage. CALGARY ALTA / FE 28 / 88. Five Cents Small Queen paying the half ounce Empire rate to England. CALGARY ALTA. / FE 29 / 88. Three Cents Small Queen to St. Catherines, ON. A "Leap Day" cancellation. The two covers show two different split circle daters used one day apart. The top cover is struck with a 23 mm split circle which looks very much like the third strike pictured in Paul Hughes's Proof Strikes of Western Canada, Vol. 1, page 1. The mystery deepens, however, in that the strike shown here is dated over eight months prior to the proof strike date of NO 8 / 88 in the book. Obviously, further research is required. The lower cover, dated one day later on FE 29 / 88, was posted on "Leap Day". The stamps on both covers were cancelled with the same quartered obliterator. 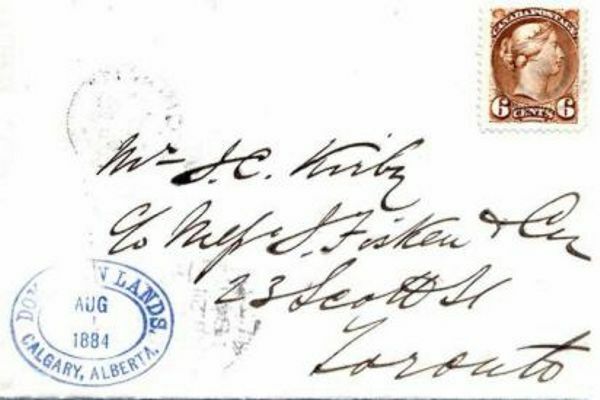 Mailed from Calgary, this cover was routed via London and received a REGISTERED / LONDON red oval marking dated June 14, 1888. Other markings include a CPR West of Winnipeg, East RPO as well as a Hamburg June 15, 1888, receiver. The Six Cents Small Queen is a one cent overpayment of the five cents rate to Europe. The Five Cents registration stamp is perf 12.11 x 12.11. 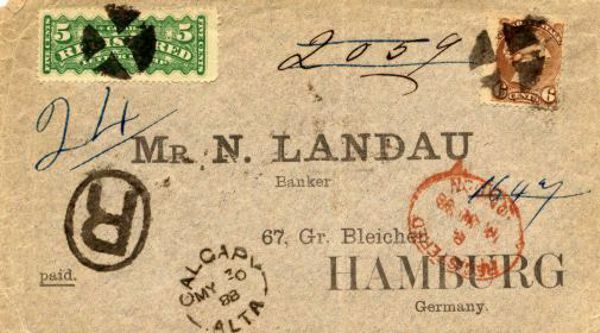 The cover was sent from Calgary to Eloria, ON. The CALGARY / ALTA. / DE 22 / 88 town strike is from the first full circle hammer, and is just two months after the proof strike date shown in the Paul Hughes book. The Royal Hotel, built by James Reilly (see corner card) in 1884, was located on the southeast corner of McTavish (now Centre) Street and Stephen (now 8th) Avenue. Originally a wooden structure, it was rebuilt in 1905. The hotel was shut down in April 1912 for not operating in accordance with City of Calgary regulations. A Mr. R. L. Galbraith of Fort Steel, BC, placed an order for supplies from Hutchings and Riley in Calgary. This is H & R's acknowledgment of the order which travelled from Calgary by CPR to Golden, arriving in one day on AU 10 / 89. The second leg to Fort Steele, probably by horseback or wagon, took another week, and the card shows a receiver of AU 17 / 89. Hutchings and Riley operated several hardware stores in the west starting in the 1880s. The business went through several ownership changes, but still survives to this day. Now specializing in western wear, the company at present operates under the name of Riley and McCormick. The correct rate of 5 cents to Ireland is paid by 2 Cents and 3 Cents Small Queens cancelled Pekisko, Alta., AU 4 / 97. On the back are transit marks of High River, Calgary, and two offices in Ireland. Pekisko was a small ranching centre about 30 km southwest of High River in the Alberta foothills. The post office opened on August 1, 1886, and serviced the local ranching area. During the territorial period, Pekisko processed very little mail and markings are scarce. 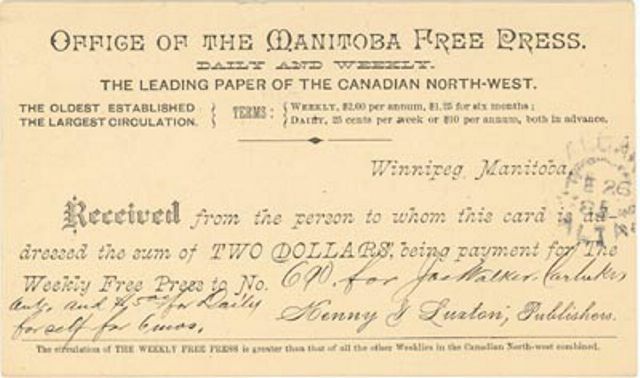 In 1897, the Pekisko post office had revenues of $98.96 and paid salaries of $28.00. The distinctive corner card, showing a black steer and "Bar S" brand, is of the Walter Skrine Ranch. Skrine, an Irish settler, came to the North West in 1883, and was a famous figure in the ranching history of the Calgary district. P. O. HIGH RIVER, ALB. In 1895, Walter Skrine returned to Ireland and married Nesta Higginson, a famous Irish poetess in her own right. 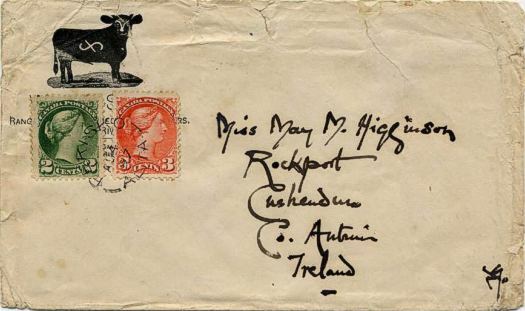 They returned to the ranch at Pekisko, and this cover is addressed to her younger sister back in Ireland. Nesta continued writing her poems and stories under the pen name of "Moira O'Neill", but now included the beauty of the prairies and foothills which rivalled the enchantment of her Emerald Isle. The story of Moira O'Neill is a permanent exhibit in the Ranching section at the Glenbow Museum in Calgary. The covers are dated AM / JU 13 / 99 and PM / AP 3 / 99. Both covers have a 2 Cents and a 5 Cents Leaf Issue paying the 7 cents Registered Domestic rate. The Calgary, Alta. squared circle Type II is RF 10 and as such is in most collections. The Squared Circle Cancellations of Canada handbook shows the earliest known strike as JA 10 / 94 and the latest OC 22 / 00. Indicia known are Blank, AM, PM and 7, the latter being rare with only a few strikes known. 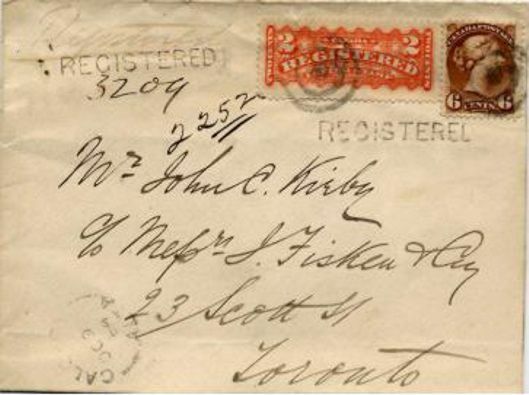 The AM cover is a preprinted Alfred Tyler return envelope to London, Ont., while the PM cover is hand addressed to William Rennie, Toronto. 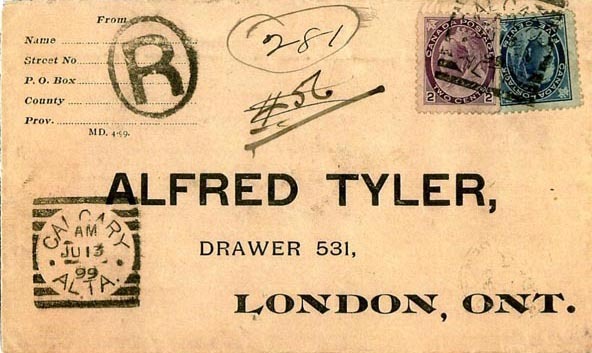 Both were seed merchants for many years around the turn of the century, and their covers have supplied countless postal history collectors with examples for their speciality. 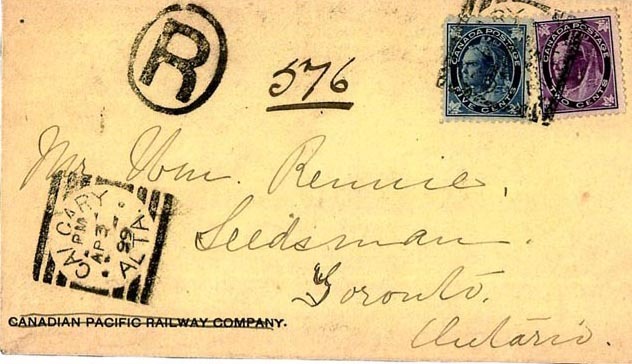 Note the Rennie cover is a CPR company envelope with the name scratched out. Hotel Noble illustrated corner card cover to Seattle, Wash.
Three Cents Medallion cancelled MACLEOD & CALGARY R.P.O. / No. 1 / AP 1 / 33. The Noble Hotel opened its doors in 1920 in a building converted from an existing structure. In 1939, the hotel was renovated and expanded. The original Noble Hotel was demolished in 1964 and replaced by a new Noble Hotel, a short distance away on 12th Avenue. This new Noble Hotel was later renamed the Westward Inn which still stands. Copyright © 2007, 2013 The British North America Philatelic Society. The documents on this web site are for informational and non-commercial or personal use only. Documents on this site shall not be used on other sites or for commercial purposes without permission.